August 5, 2012 - Airbus has successfully powered up the flight-deck of A350 XWB “MSN1” for the first time, following the initial application of electrical power to the aircraft’s front fuselage. This significant milestone was passed only two weeks after this section was delivered to the Final Assembly Line (FAL) in Toulouse. Moreover, it gives a promising indication of the A350 XWB’s progress in pre-FAL and the readiness of the aircraft’s systems. Flight-deck power-on is an important step on the route to complete aircraft power-on and first flight, because it enables most systems functional checking to be undertaken. Having achieved this nearly a year before first flight will allow early identification and resolution of potential issues and thus help to protect the aircraft’s development schedule. Testing of the front fuselage section will proceed during this summer. This will be followed by the power-on of the entire fuselage later this year. The Airbus A350 is a family of long-range, wide-body jet airliners under development by European aircraft manufacturer Airbus. The A350 will be the first Airbus with both fuselage and wing structures made primarily of carbon fiber-reinforced polymer. It will carry 250 to 350 passengers in three-class seating, depending on variant. The redesigned A350 was marketed by Airbus as the A350 XWB, where the XWB stands for Extra Wide Body. The launch customer for the A350 is Qatar Airways, which ordered 80 aircraft across the three variants. Development costs are projected to be US$15 billion. The airliner is scheduled to enter airline service during the second half of 2014. As of 20 January 2012, 561 orders had been placed for the new aircraft. Although Airbus previously suggested Boeing's use of composite materials for the 787 fuselage was premature, and that the original A350s would be made from aluminum-lithium (Al-Li), the new A350 XWB will feature large carbon fiber panels for the main fuselage skin. After facing criticism for maintenance costs, Airbus confirmed in early September 2007 the adoption of composite fuselage frames for the aircraft structure. The composite frames will feature aluminum strips to ensure the electrical continuity of the fuselage (for dissipating lightning strikes). Airbus will use a full mock up fuselage to develop the wiring, a different approach from the A380, on which the wiring was all done on computers. In January 2008, French-based Thales Group won the US$2.9 billion (€2 billion) 20-year contract to supply avionics and navigation equipment for the A350 XWB. 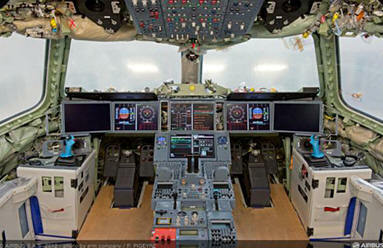 Thales competed against Honeywell and Rockwell Collins for the flight deck supply contract. US-based Rockwell Collins and Moog Inc were chosen to supply the horizontal stabilizer actuator and primary flight control actuation, respectively. The flight management system will include several new safety features. Regarding cabin ergonomics and entertainment, in 2006 Airbus had signed a firm contract with BMW for development of an interior concept for the original A350. On 4 February 2010, Airbus signed a contract with Panasonic Avionics Corporation to deliver in-flight entertainment and communication (IFEC) systems for the Airbus A350 XWB.